This article applies to Payroll by Wave in both Canada and the US. Before you start, make sure you've added your employees into Wave, making sure to include their salary information. 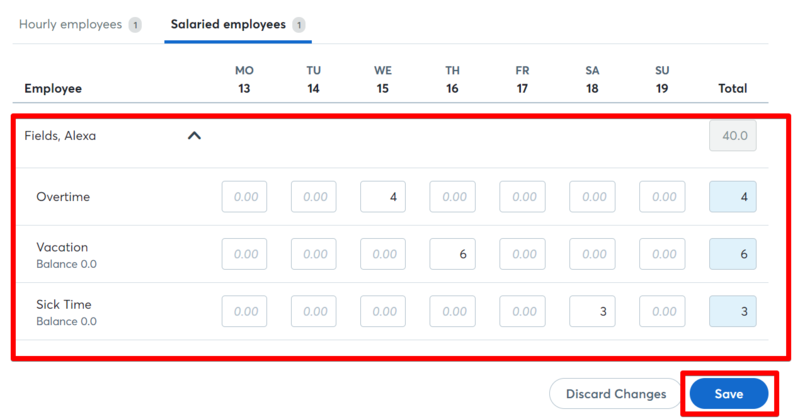 Once you've added your employees, you're ready to fill in their timesheets. If your employee is compensated with a yearly salary, do not fill in his or her timesheet unless you would like to record and pay your employee overtime or vacation hours. Wave uses the salary you entered in your employee's profile to calculate his or her paycheque. Any hours you enter into the field for regular hours will be added over and above your salaried employee's regular pay. Click Payroll in the menu at the left side of your screen, then Timesheets. In the Overtime Pay row, enter any overtime hours your employee worked that week for which they will be compensated, then click Update. Any hours entered into this row will be counted as time and a half when your payroll is calculated and added on top of any regular pay. In the Vacation Pay row, enter any paid vacation hours your employee used that week. You're done! Your salaried employee's timesheet is now up to date and any overtime and vacation hours will be reflected in your payroll. If your employee worked any overtime hours or used any paid vacation hours, input those hours in the Overtime Pay or Vacation Pay rows. Any hours entered into the Overtime Pay row will be counted as time and a half when your payroll is calculated and will be paid in addition to the employee's regular pay. You're done! Your employee's timesheet is now up to date and any overtime and vacation hours will be reflected in your payroll.